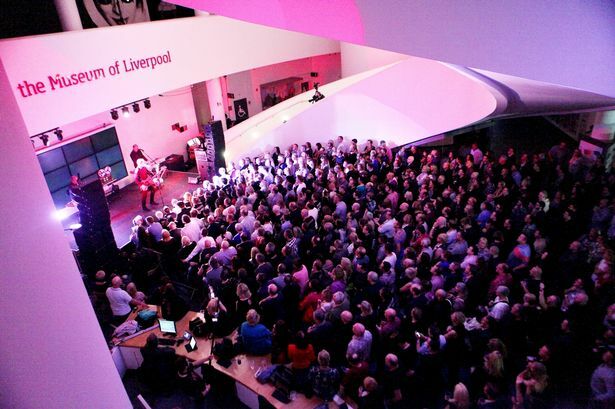 Last summer, I mentioned that OMD were doing a special one-off show at the Museum Of Liverpool devoted to their forward looking “Dazzle Ships” album and being that this is the age of media overload, for the 1100 people who were not there on November 1st or 2nd of last year, the event was [rightfully] recorded for posterity. Now there will be a DVD/CD combo pack devoted to the full concert so that anyone could have the pleasure in the privacy of their own home. Beats the price of Transatlantic travel all to hell, methinks. This time OMD have used the crowdsource model to sell their wares, and the final product will be a must-have for Ye Olde Record Cell. 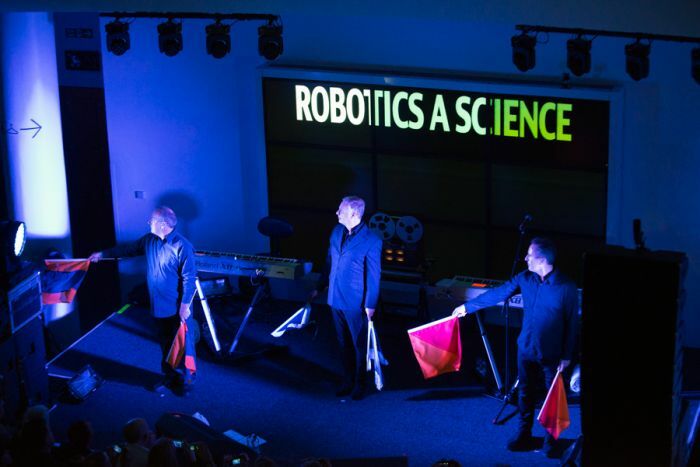 Since drummer Malcolm Homes was still convalescing from a heart attack which saw him revived onstage at the sweaty Toronto gig from their English Electric tour the previous year, this gig was made special by the re-emergence of original OMD “drummer” Winston, the reel-to-reel tape recorder. So the vibe here was designed to be close to the early OMD period when just Andy McCluskey and Paul Humphreys were just starting out. The same can’t be said for their “Dazzle Ships” album which was as ambitious as the band ever got. This show was made especially to coincide with the Dazzle Ships [actual seafaring vessels] exhibition at the Museum Of Liverpool. Now the record of it can be yours, if the price is right. The primary package is a 40 page hardbound Book/DVD/CD package with the full gig on either disc. The DVD is PAL, but don’t let that stop you. At worst, most computers will be able to play the thing, if you lack the requisite multi-standard DVD player that graces many a living room, including mine. The show was salted with rarities than many OMD fans have been clamoring for on their forum until now, including the previously unheard tracks “Dazzle Ships (Parts I, IV, V & VI)” which were played as part of the show. And what did the show entail? This we know! A very fine selection of material, heavy on “Dazzle Ships” and “Architecture + Morality.” The band promised one song that had never been played before, but delivered two: the moody “4 Neu” and the heartbreaking “International;” possibly my favorite OMD song 32 years later. The OMD Pledge Music campaign just opened up on Friday, and already, many of the more expensive points of entry have sold out. The autographed DVD package [£33/$50] is long gone. As are the actual semaphore flags used in the photo above [£208/$318]. Even more exotic was the actual backing tape used on Winston for the concert, signed by the band, of course. A steal at £500/$764 for any budding sound engineers/vintage gearheads out there who might actually be able to play it. All that’s left for us proles to buy are the straight book/DVD/CD package for £28/$43 and the DL of the concert, which will be available in FLAC for the demanding amongst you for the relative pittance of £8/$12. There are 108 days left to buy-in to this, and thankfully, I should be able to round up the necessary scratch in a month or so. Interested partied should investigate here. This entry was posted in Core Collection, DVD, Want List and tagged 2014, Dazzle Ships, live album, Museum of Liverpool, OMD. Bookmark the permalink. When I got my email last week I said out loud to no one but my Boston Terrier April “Must have.” She just looked at me as she does and cocked her head a bit to the side with curious eyes…need to make sure I can watch PAL, but MUST HAVE!!! With all of those great DVDs from the UK, programming your player to watch PAL is a must. Many players (an not just high-end ones) have a way to permanently program codes to operate DVDs from around the world. It’s worth an Internet search to see if your player has this capability. When I was in Scotland back in 2012 I got the movie Local Hero, brought it home, and discovered I couldn’t play it. After the fix, it has opened a whole new world to me. Oh, and yes, I’m getting this OMD. I bought the Live in Berlin set a few years ago, and I love it… although I’m a little discouraged that the book-like cover is warping a bit. Brian – Remind me to post on the wide world of multi-standard TV one day. I first dove deep during the early 90s when I bought a 27″ multi-standard monitor [hah! not cheap!!] and the worst VHS deck I’ve ever had, a multi-standard Hitachi unit that almost never worked. It was in-shop more often than not. But music video was a significant part of my diet then, and it had to be done! My first DVD player [only in year 2000, I was no longer an early adopter of video tech] was a region-free, multi-standard, Macrovision-free, modded unit. But just a few years afterward, my Sony 27″ monitor died, and was replaced by a free CRT 30″ TV from friends who “went flat screen.so that meant that my DVD player could play PAL DVDs [I only had a handful] but the signal was no longer compatible with my monitor. After that, watching PAL DVDs entailed about 4-6 hours of production on my iMac to generate an NTSC copy of any PAL DVDs. Ugh. Labor!! But it was either that or watching DVDs on my computer. Not cool. The DVD player finally gave up the ghost, eventually and was replaced last year with a modern multi-standard DVD player that cost a fraction of the first model, and this bad boy outputs a flawlessly synched NTSC signal without audio drift thanks to the chips inside that convert and demux the audio on the fly, reconstituting a perfect NTSC signal for my viewing pleasure. This is not new, per se. Chasinvictoria had a DVD unit that attempted this about a decade ago, but due to the differing frame rates between NTSC and PAL, the audio signal, which it did nothing to, quickly went out of synch in a matter of minutes, rendering your attempt to watch a PAL disc on your NTSC TV pretty much null and void. Yeah, I got the “Live in Berlin” package as well, but mine is holding up pretty well. I keep my “exotic” packages off rack. Maybe that’s another post [or even series…] right there, but I’d hate to encroach too heavily upon the sacred turf of Version Crazy [whom you should be reading – check the sidebar]. Re the DVD. MakeMKV is a free, ad free program available online. The newest version is literally a two clicks conversion process. If the concert is two hours long this program will convert that region 2 DVD to a nice quality MKV file in about twenty minutes. If MKV s not our file format of choice you can use Handbrake (also ad free and totally free) to convert it to MP4. Tim – Thanx for the tech talk. Echorich, take note… Unless you’d just like to spend $50 for a unit like I did and bypass the computer work.